Linked battery charging was introduced by PAG and is unique to the PAGlink system. Now you can charge more batteries on fewer, smaller and more efficient chargers. 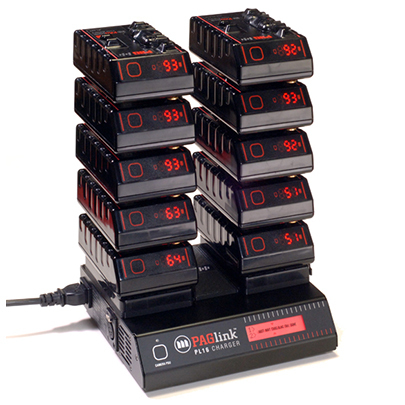 PAGlink makes location charging easier and reduces the number of chargers required to manage your batteries. 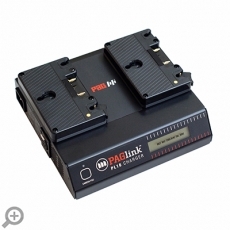 The 2-position PAGlink PL16 Charger is the ideal location charger for PAGlink Gold Mount Li-Ion batteries. 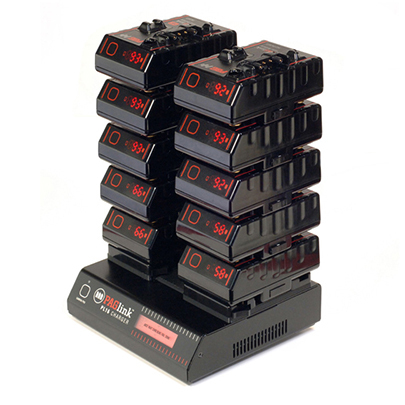 Up to 16 PAGlink batteries can be charged simultaneously (8 per channel). PAGlink means no more interrupted sleep on location, swapping charged for discharged batteries on your charger, just to get them all charged by the morning. At the end of a shoot, simply link your batteries and connect them to the charger. The next day, they will be fully-charged and ready to go. 4 fully-discharged 94Wh batteries will be fully-charged simultaneously in less than 6 hours; 8 batteries in less than 12 hours. 150Wh PAGlink batteries will take 50% longer. A Recovery Charge Program is included for deeply discharged batteries. Two presses of the charger’s front panel button will enable the batteries to accept charge. Additionally, the charger will automatically reset Li-Ion batteries if their cut-out has been tripped. The high-power PL16 is capable of supplying 6A at 16.8V (approximately 100W). It can also be used to power your camera from any AC supply worldwide, via the charger’s built-in 100W camera power supply, which has an XLR4 output. The PL16 is compact, quiet and cool-running, and features a hard-wearing aluminum case. It weighs only 3lbs and its slim design makes it easy to transport. Battery Connectors: 2 x Gold Mount. Up to 8 PAGlink batteries per channel may be charged. Batteries can be in any state-of-charge. The most-discharged batteries will be given a higher charge priority. Fully charged batteries stop accepting charge automatically and independently of other batteries. If a battery will not accept charge, and is indicated as absent (ABST) on the charger display, a Recovery Charge Program can be initiated by two presses of the front panel button, which will enable the battery to be charged. Additionally, the charger will automatically recover a Li-Ion battery where the output has been shut down. 100V to 265V AC. Frequency 50-60 Hz. The times given are for fully-discharged to fully-charged 94Wh batteries equally distributed across both channels. 150Wh batteries will take 50% longer. Suitable for powering cameras that can accept a 16.8V input. The camera power supply function is operated by pressing and holding the Camera PSU button on the charger’s front panel for 1 second. Charging is suspended whilst the power supply is in use. Output Connector: XLR4F connector (pin 1 neg. pin 4 pos).